If you need to express condolences to a Christian family dealing with the loss of a loved one, you may be wondering what kind of service to expect and what gesture is appropriate. Christianity encompasses a broad spectrum of denominations, but for our purposes can be easily broken down into two groups: Catholic and Protestant. While funeral services vary somewhat within these two groups, and within the families belonging to them, here are some basic guidelines to help you feel comfortable and perform what’s expected at a Christian funeral service. Catholic funerals range from very formal to casual. Last rites are usually performed before the services. Mass is generally held before burial, and friends and family are welcomed and encouraged to come. During Mass, the priest will speak, loved ones will light candles, and the congregation will pray together. Afterwards, the family gathers at home and friends provide them with food. Graveside services are common, and it’s perfectly acceptable to follow along with the funeral procession from the funeral home to the gravesite to show support for the family and respect to the deceased. Flowers are a wonderful way to express your sympathy to the family and extend your respects to the deceased. Alternately, families may request cash donations to a charity the deceased was particularly fond of. It’s not uncommon for friends or family to set up an account to receive donations for the deceased’s children, such as a college fund, especially if the death was premature or unexpected. Arrange for flowers to be delivered before the funeral or Mass, or consider having a refreshing fruit basket sent to the family home afterwards. Non-Catholic Christians are known as Protestant, which includes Baptists, Methodists, Lutherans, Presbyterians, Church of God, and many others. The main difference among these groups is the formality of services. Some adhere to a predetermined outline, while others allow the service to be performed more freely. Any suit or dress appropriate for church services will be suitable funeral attire. If you have any questions about dress or the program, feel free to call the funeral home before the service to ask. As at Protestant funerals, flowers are welcomed and encouraged. Lovely arrangements of roses, carnations, lilies, tulips, or a mixed arrangement are perfect. Schedule the delivery ahead of the service so the flowers will be on display during the service. During the service, which usually lasts between 30 minutes and one hour, the minister will read scriptures and lead the congregation in prayer. It’s common for someone close to the deceased to offer a eulogy, which normally lasts about five minutes. After the service, feel free to join the funeral procession if there is a graveside service planned. Sometimes, no graveside service is held, but this is usually announced by the minister at the close of the service at the funeral home. 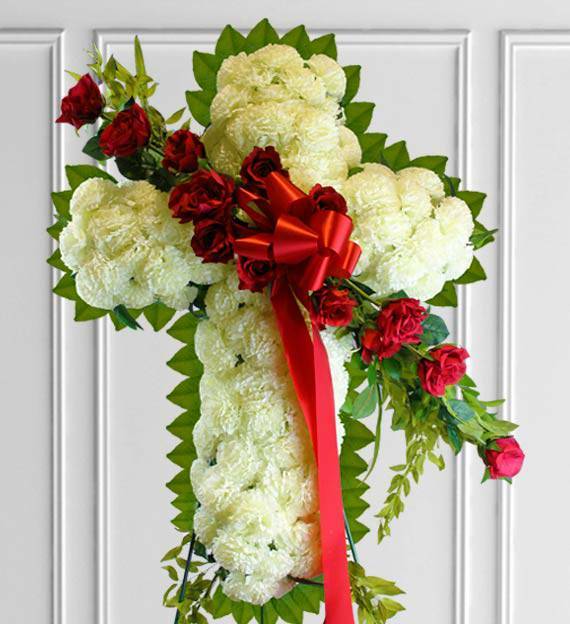 If you’re unable to attend services for your Christian friend, express your condolences to the family in a heartfelt note and an arrangement of flowers, or simply with a visit to the home soon after the funeral. Christians find hope in the afterlife, so focus your kind comments to the extraordinary life led by the deceased, how much that person meant to you, and how they’re in a place without suffering. You’ll find the majority of attendants of Christian funerals doing this.